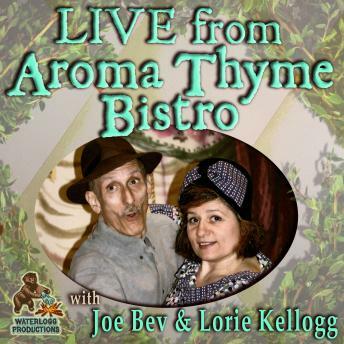 This lively hour of stories, songs, and poems about love were performed before a live audience at Aroma Thyme Bistro in Ellenville, New York. Among the highlights of the evening was a parody of Who's Afraid of Virginia Wolfe? called 'Who's Afraid of a Virginian's Wrath?' as played by George and Martha Washington, performed by husband and wife team Joe Bevilacqua and Lorie Kellogg; Lorie singing 'The Aroma Thyme Bistro Opera' and reading 'Ode to a Transfer Station'; and Joe and Lorie in a sketch called 'Valentine Vignette.' There is also some great piano playing by Wayne Hosford and a healthy eating tip from Aroma Thyme Bistro owner and chef Marcus Giuliano. The hour is hosted and produced by Joe Bevilacqua, with additional music by Paul Salomone.